If you are fortunate enough to spend time in the Axarquía, away from large urban areas, one of the delights that you will encounter is the sight of the night sky, virtually free from the light pollution. An amazing spectacle awaits you when you see what nature has to offer from the hillsides of this part of Andalucía during the hours of darkness. Instead of counting the visible stars in dozens, suddenly they will be present in thousands. You will become aware of the patterns that form the constellations, and even though you may not know their names, you will see that amongst them twinkle many varied stars. The brighter ones can shine in several colours ranging from orangey red, through yellow, white and finally to blue. The blue stars are the hottest of all, with temperatures so high as to be meaningless to our minds. With our dry air up in the Axarquía hillsides, we get a really clear view of all that the night sky can offer. One of the most awe-inspiring sights is the Milky Way, the luminescent band of light, clearly visible in the Andalucían night sky. The Milky Way spreads across the sky, passing through the constellation known as Cygnus (The Swan). It is quite astonishing to realize when we look up at this broad band of hazy light, that what we are actually seeing is millions and millions of single stars, too far away to be identified individually. Can you imagine staying at your villa in the beautiful countryside, East of Malaga, maybe floating on your back on an airbed in your swimming pool, looking up at all this wonderful display that nature offers to us? Let me tell you, it is MAGIC! There is yet another cosmic masterpiece available. At certain times of the year our planet Earth passes through bands of dust and debris that circle the Sun. We see these as meteor showers. There are several occasions each year, but a good show is the Perseids meteor showers, around the 12th August. Once again we shall be floating on our pool, watching these tiny fragments of space dust hurtling into our atmosphere at enormous speeds, 30 miles per second or more, and burning up to provide magnificent celestial fireworks. Much slower are our own Earth-launched satellites which drift lazily by, so often these days, that you can usually spot one within a few minutes. Their speed is deceptive though, because the satellites are very high, they actually have to maintain about 18,000 miles per hour to remain in orbit. Do you have a favourite place where you can gaze at the natural wonders of the Earth? This entry was tagged Milky Way, night, photography, stars. Bookmark the permalink. This is just amazing..a new destination on my list! Love the starry night sky. Thank you for visiting my blog. Oh yes, you must! 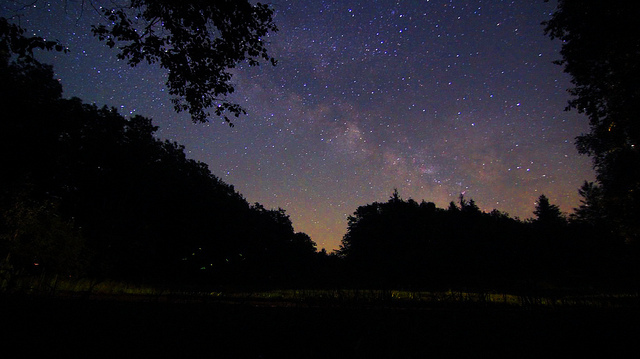 That´s one of the great things about Canada – vast, open spaces – perfect for star gazing! I live in Shanghai, China for work and I didn’t realise how much I miss the stars until I went home at Christmas and looked up. My brother lives out in the country and hardly any neigbours, so a great place for star gazing… heading home today for summer break. Will have to take advantage of the night skies.